KEF offers merit-based scholarships to Koniag, Incorporated shareholders and descendants. Awards may vary depending on availability of funds. GPA requirements vary by award and must be met to be considered eligible for award. Applications must be postmarked or time-stamped by the posted deadline. Awarded funds are disbursed directly to the program, and cannot be applied to accounts in arrears. Special Scholarships have additional requirements for field of study which must be met. Scholarships administered on behalf of our partners have additional eligibility requirements which are detailed in the description of each award. All applicants must be Koniag, Incorporated shareholders or descendants. Descendants must have an approved shareholder descendant database application submitted and approved by Koniag, Incorporated’s Shareholder Records Manager prior to any disbursement of award. Please see form for details. For more information regarding the Descendant Database Form and enrollment shareholder ID’s, please e-mail shareholderrecords(at)koniag.com or call (800) 658-3818. The Shareholder Descendant Database Application can be found here. Because KEF is a private nonprofit, IRS regulations require that all scholarship, vocational, and career development funds must be mailed directly to the institute where training is taking place. KEF’s new online application portal is up and running. In just a few easy steps, applications can be completed and submitted for review. To apply, visit www.koniageducation.fluidreview.com or click here. Applicant portal information is now part of the application process as a common form. This allows KEF to keep your personal contact information, school, and financial aid information all up to date. If you need to make any changes, please do so when beginning a new application, or by emailing our Scholarship Manager at scholarships@koniageducation.org. Updating your account on a regular basis helps ensure that you receive KEF correspondence and that your scholarship disbursements are processed correctly and arrive at your school on time. Users with limited Internet connectivity may download and submit applications by mail. Note that additional forms may be required. View individual scholarships for details. From your first year of high school to the highest levels of a doctoral thesis, from vocational classes to your college degree – KEF is your partner in education. We invite you to browse our scholarships and see how we can help. Click on the link below to check out our updated Scholarship Catalog! KEF’s online application site is currently accepting applications. In just a few easy steps, applications can be completed and submitted for review. Have questions? Call or email us at (907) 562-9093 or scholarships@koniageducation.org. There are few forces in the world with the potential to positively impact a community so much as a single experienced, passionate and dedicated leader. A person like this gives selflessly of their time and their energy, and influences everything they touch. Brent Parsons was such a man. To honor Brent’s memory and lasting impact to our Alutiiq people, Koniag and KEF are pleased to announce the Brent Parsons Memorial Scholarship. Brent was a long-time partner in an audit firm and was integral in keeping Koniag a financially strong corporation. He drew on his vast knowledge of financial and accounting best practices to strengthen benefits for shareholders. Always a mentor, Brent worked with many of Koniag’s board members and staff to help them realize their own potential. And as a life-long learner and recipient of a KEF scholarship, Brent understood and valued education. There is a quote from the artist Makoto Fujimura that goes, “generative paths lead to resourcefulness, patience, and general creativity in life. They lead to cultural – and human – thriving.” Brent walked a generative path in everything he did, and through this scholarship for Koniag shareholders and descendants in the fields of Accounting and Finance, Brent’s legacy will thrive for our students as they pursue their own educational goals. We know that Brent will be looking down and smiling as future generations receive degrees and achieve their fullest potential. The Brent Parsons Memorial Scholarship will be awarded to one student in Finance or Accounting annually in the amount of $5,000. Applications are due June 1. To learn more or apply, please visit us online at koniageducation.org, or call our office at 562-9093 in Anchorage, or 481-4122 in Kodiak. KEF General Scholarships are awarded to students with a GPA of 2.5 or higher who are pursuing a degree through an accredited educational institution. *KEF offers merit-based scholarships to our shareholders and descendants. These scholarships are competitive and are scored for completeness by an independent scholarship review committee. Awards may vary depending on availability of funds. Applications must be postmarked or time-stamped by deadline. **Because KEF is a private nonprofit, IRS regulations require that all scholarship and career development funds must be mailed directly to the institute where training is taking place. To access the electronic application and get started today, click here! To download a paper copy of the 2019 ANC HEP Policies & Application, click here. Transpac Group brings more than 30 years of experience and leadership to the Pacific Northwest Forest industry. Giving back is a vital part of Transpac Group and their aim is to contribute to the communities that have become part of their own. In addition to improving Kodiak’s economy through employment, CEO and President Charles Kim has invested in the education of our people by donating the funds that make this scholarship possible to Koniag shareholders and descendants who are studying in fields of natural resources such as forestry and have a GPA of 3.0 or above. Are you an enrolled member of NVA attending post-secondary school? If so, you’ll be happy to know that KEF and NVA have teamed up to make applying for your scholarships as easy as possible. Our goal is to streamline the application process to help students maximize their scholarship funding. NVA scholarship applications should be from students currently in an accredited post-secondary program, either part- or full-time. We will be awarding a special $1,000 scholarship to be disbursed this spring semester, and future awards will coincide with KEF’s Special Scholarship application (June 1 deadline). All applications can be submitted through Koniag Education Foundation. To learn more, or to apply, click the link below! *Because KEF is a private nonprofit, IRS regulations require that all scholarship and career development funds must be mailed directly to the institute where training is taking place. Alyeska provides scholarship funding to organizations with the goal to provide partial monetary support to Alaska Natives for training, education, and internships that are needed in preparation for careers with Alyeska and on the Trans Alaska Pipeline System (TAPS) or other oil industry related jobs. This funding is strategically focused to increase the pool of qualified Alaska Native applicants in specific job categories. The Alyeska program is an in-house matching scholarship. Students who qualify will be identified by KEF and notified individually if they are eligible. No additional application is necessary. The Rhea Mae Knagin Scholarship is designed to recognize and provide financial support to any student who demonstrates scholastic ability who is seeking a higher education. There will be a total of three scholarship awards. One for $1000.00 to the applicant receiving highest total score and two for $500.00 to applicants receiving second and third highest total scores, respectively. Magnel “Maggie” E. Drabek was born in Afognak village in 1926 to Olga (daughter of Evdokia (Nekrasoff) and Peter Paul Naumoff of Afognak) and Louie Larsen (a fisherman and merchant marine originally from Alesund, Norway). Maggie was known for her fortitude, practical leadership, diplomacy, humor and creativity. In 1947 she married Henry “Hank” Alvin Drabek of Springville, N.Y., after they met in Seattle, Wash., while Hank was decommissioning the aircraft carrier Bonhomme Richard after World War II. Together they raised two sons, Anthony “Tony” John and Alvin Lawrence. Hank was overseas for many years serving in the Navy during the Korean War. Regardless of where they lived, Maggie was always involved in community activities and recognized for her talents. For example, during their years living on the Coronado Naval Base in Southern California, she won numerous artistic awards for hat designs, publicity posters and costumes. They returned to live in Kodiak after Hank retired from the Navy. Maggie worked for many years in the Kodiak school system as a cook and later as a teacher’s aide before retiring for health reasons. Prior to her work in Kodiak schools, she served as forelady for several prominent fish processors. Maggie’s family remembers when the 1964 earthquake and tsunami struck, the only household item she grabbed before heading for high ground was her “Big Ben” alarm clock so she wouldn’t be late for work the next morning. Ironically, while she had her alarm clock, the cannery she worked at had been washed away in the night, along with her house and all the family’s belongings. When Maggie was a young, single woman living in Washington, she gave birth to a son who she was unable to care for at the time. Maggie made the difficult decision to give him up for adoption. Her son, Roger McCracken, now lives in Bellevue, Wash., and was reunited with his two brothers in 1998 after Tony’s search for Roger proved fruitful. The families are pleased to honor Maggie’s memory through the creation of a memorial scholarship fund to support education, arts and cultural studies students. Maggie passed away in 1990. The memory of her as a loving mother, wife, friend, sister, aunt and daughter, as well as her passion for education and Alutiiq culture, lives on. The Larry Matfay Cultural Heritage Scholarship is named in honor of Larry Matfay. Matfay was an Alutiiq elder and the last chief of Akhiok. He freely shared his extensive knowledge of the Alutiiq culture to revitalize and renew our heritage and pride. Click here to view Larry Matfay’s complete biography. *KEF offers merit-based scholarships to our shareholders and descendants. These scholarships are competitive and are scored for completeness by an independent scholarship review committee. Applications must be postmarked or time-stamped by deadline. Patti and Glenn Godfrey hold the awards for “Citizen of the Year” in 1999. The award was given to Glenn by the Alaska Federation of Natives. Photo courtesy of Alaska State Troopers. Glenn was born and raised in Kodiak and joined the Alaska State Troopers in 1970. He served as a patrol trooper in Anchorage, Juneau, and Northway, where he was responsible for drug enforcement along the Canadian border. In 1978, he was promoted as post commander for Western Alaska in Bethel where he was instrumental in the development of the Village Public Safety Officer (VPSO) program. Godfrey was later assigned to the director’s office in Anchorage and was put in charge of the VPSO program, statewide search and rescues, and the Trooper’s Special Emergency Reaction Team. Godfrey went on to serve as chief of Rural Enforcement and deputy director of the Alaska State Troopers. Knowles promoted Godfrey to director of the Trooper Division in 1995 and he succeeded Ron Otte as Commissioner of the Department in August of 2000. Upon his retirement, he was appointed to Gov. Tony Knowles’s cabinet as the Commissioner of Public Safety. Mr. Godfrey was the first Alaska Native in both posts. Godfrey also served as chairman of Koniag Inc., the ANSCA regional corporation for Kodiak, and was named “Citizen of the Year” by the Alaska Federation of Natives in 1999. This scholarship was established to help our Alutiiq people pursue self-improvement and positive leadership roles. Career Development Scholarships are awarded to individuals enrolled in non-degree programs such as licensing and certification training’s, workshops or other career advancing programs which are less than 6 weeks in duration.. Limit 2 per year per applicant. The Vocational Award is for individuals interested in non-degree technical education and training, longer than 6 weeks in duration. 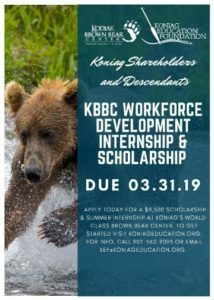 Koniag, Inc. has established an internship/scholarship program to seek out Koniag’s best and brightest shareholders and descendants to intern in subsidiaries of Koniag Development Corporation (KDC). Scholarship recipients are awarded an annual scholarship of $10,000 throughout their post-secondary education. This award allows the student to focus on his/her field of study and gain related work experience for a six- to 10-week period during the summer, while helping Koniag identify, cultivate, and encourage future leaders. To qualify, students must have a minimum GPA of 3.0, agree to intern in any one of Koniag’s subsidiaries during the summer and be willing to relocate for a period of six to 10 weeks during the summer months. Students will receive a salary during their internship and travel and lodging will be funded by Koniag, Inc. Students who participate in the internship will receive renewed funding of $10,000 each year until graduation. You may apply for this scholarship in conjunction with other KEF scholarships. All applicants must submit the Internship Agreement Form. The purpose of the Koniag Angayuk Scholarship is to identify and encourage Koniag students to become involved with Koniag and our subsidiaries. Koniag encourages our people to pursue their education and become familiar with Koniag, their Regional Native Corporation, and the employment opportunities that are available to them through Koniag’s family of companies. The program is designed to encourage and promote our future leaders.